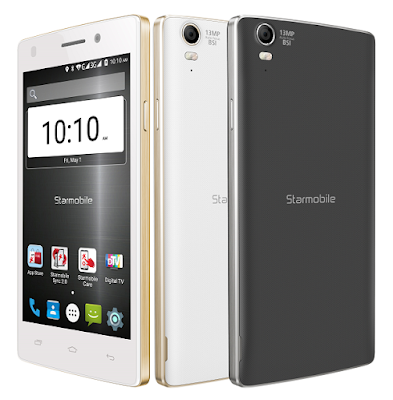 Home Smartphones Starmobile UP Max: 5-inch Lollipop phone with 5,000mAh battery and a built-in DTV tuner! Starmobile UP Max: 5-inch Lollipop phone with 5,000mAh battery and a built-in DTV tuner! After pioneering the mobile DTV revolution in the Philippines, Starmobile is once again changing the game as it introduces the new Starmobile UP Max, a 5-inch quad-core Android Lollipop smartphone with an gargantuan 5,000mAh battery and a built-in DTV tuner! Yet despite its enormous power pack, the phone maintains a slim profile at 9.6mm (the first and only 5000mAh phone in the market below 10mm) and weighs in at only 175 grams. The Starmobile UP Max comes with a detachable rubber antenna included in the box. With DTV, UP Max users can watch and/or record cable-quality DTV channels for free wherever DTV services are available even without a SIM card and Wi-Fi or 3G/4G connection. For users looking for an excellent camera phone, the Starmobile UP Max doesn’t disappoint as it has a premium Sony BSI camera which churns out amazing 13 megapixel photos. The Starmobile UP Max will be available in stores nationwide beginning the second week of June 2015 for only P7,490.